Being able to access APIs from major social media platforms can be used as a powerful and useful tool. Fortunately, it's not hard to do so, especially using Spring Boot, and more precisely, the Spring Social module. Each of these projects provides tools to communicate with their respective APIs. In this tutorial, we'll be relying on Spring Social Facebook to make a simple application that authenticates and authorizes a user, and then shows them their own Facebook feed. There are two things needed for this project to work. We'll be starting off with a default state Spring Boot application. Thankfully, using Spring Initializr or even the built-in IntelliJ Idea Spring Initializr plugin, we can easily get a skeleton project to build upon. Whichever option you choose, select the Web and Thymeleaf dependencies, we'll add the other ones later. Additionally, in order for Spring Social to be able to communicate with the Facebook API, it requires a Facebook Application. In order to create a Facebook Application, you must have a Facebook Developer account. Opening the settings tab after selecting your application will yield the required information to set-up the connection between Spring Social and your application like the "App ID" and "App Secret". A dependency for the H2 Database is included simply because Spring Boot requires a data source, and it's the easiest to just provide one for it. A connection between your Spring application and the Facebook application is required to proceed. Defining these two properties alerts Spring Social Facebook and it sets up two crucial beans for our application. ConnectController - This class manages the connection flow for the account-to-service-provider and it handles all of the requests regarding Facebook. FacebookConnectionFactory - The Facebook implementation of the Spring ConnectionFactory class. It provides a set of methods for creating Connection instances for Facebook. As mentioned above, the ConnectController is the main workforce in this area. This controller will handle our GET requests when we want to connect to Facebook. It requires just two simple views to work properly - connect/facebookConnect and connect/facebookConnected. Facebook can be substituted here with any other provider ID, like 'twitter', in which case it would require connect/twitterConnect and a connect/twitterConnected view. Once you click "Connect" on the first view, the form will send a POST request for our ConnectController to handle, and the OAuth authorization starts. This controller works in a simple fashion. It requires us to inject Facebook and ConnectionRepository into its constructor. The Facebook class provides basic methods for interaction with Facebook, while the ConnectionRepository class, as the name implies, is a data access interface for Connection objects. Value - Corresponds to the request parameter we wish to map. Method - Corresponds to the type of the expected HTTP method. connectionRepository.findPrimaryConnection(Facebook.class) will only be null if the user didn't authorize our application to retrieve data from Facebook. If this is the case, the application simply returns to /connect/facebook. 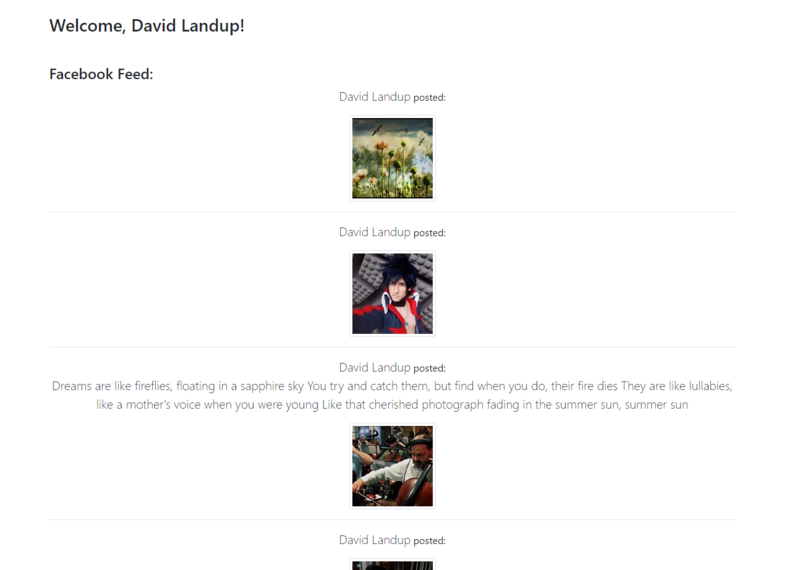 Then we make a PagedList of Posts that corresponds to the user's own feed and add it as a model attribute to our view. We now need to define the view in which we render this information with Thymeleaf. Note: Since Facebook version 2.0, the ability to retrieve a Facebook friend list was removed. This functionality is no longer supported by Facebook and trying to get a friend list in Spring will simply return an empty list. And with that, this application is concluded. Let's run it and see the result. By selecting "Continue", we authenticate the application and we're redirected to our facebookConnected.html view. AchievementOperations - Provides operations for Facebook achievements. CommentOperations - Provides CRUD operations for comments. EventOperations - Provides CRUD operations for events, as well as invitations. FeedOperations - Retrieving from and posting to a Facebook wall. FriendOperations - Retrieving friend lists. LikeOperations - Retrieving and performing likes on posts, pages etc. MediaOperations - Provides CRUD operations for media like photos/videos/albums. OpenGraphOperations - Provides operations for Facebook's OpenGraph API. PageOperations - Provides operations for Facebook pages. SocialContextOperations - Provides operations for a user's social context. TestUserOperations - Provides operations for creating and using test users. UserOperations - Retrieve user information. RestOperations - Used to place an OAuth Authorization header for access tokens sent via requests. Each of these provide sets of methods for their designated purpose, and collectively, they can be used to build powerful tools. Covering all of these would be out of scope for this blog, so we'll cover only the most important and useful ones, like posting to walls, reading feeds, and so on. // Retrieves the user's profile whose id is 4. Fun fact: The ID with the numeric value '4' belongs to Mark Zuckerberg and all ID's before this one were test accounts in the early days of Facebook. Posting to your feed is as easy as calling a single method with a String parameter. But keep in mind that you can only post to feeds of users who authenticate the application, and they cannot post to their friend's walls. This will simply post a single status with the String that you input. This functionality has been removed by Facebook in 2013. This functionality has been removed by Facebook in 2014. In this tutorial, we took a dive into Spring Social, and more precisely, the Spring Social Facebook project. 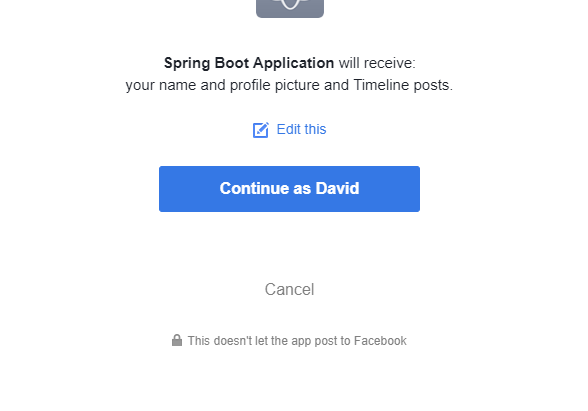 We made a Facebook developer account and a Spring Boot application with a connection to our Facebook application. Afterward, we explored some of the functionalities of the Facebook project in our own, as well as some other functionalities that this API offers.